First thing this morning my Arranger called me to come quickly to see what was in the garden. I had to take the picture through the screen (forgive the lines). She looked at me…brazenly… for a minute or so and then nonchalantly moved off into the woods. If you have seen my earlier posts over the past week, you may recognize a trend of critter visitations. And I had just posted a photo of Society Garlic which is reputed to deter deer. Guess I will have to rethink all of this. Maybe she had just arrived as I didn’t find any immediate browsing damage. Several of the bloggers I follow have recently been discussing/complaining about weeds. Let’s make a deal! I will trade you my critters for your weeds. This entry was posted in Nature and tagged critters, deer, Society garlic. Bookmark the permalink. 27 Responses to And ANOTHER Uninvited Guest??? How do they know to stay away from the weeds? Sleep tight tonight! Weeds are much easier. Dear can be devastating. We are in complete agreement. By the by, I hit a wrong button and lost an earlier comment you made and couldn’t respond. Forgive me…another senior moment. It would be nice if the deer came and weeded. With all my yews and arborvitae I think it would it would be deer heaven. I did see 4 deer come up my city street very early one morning. I thought my shrubs would be toast. I suppose we should take the larger view…but it’s hard! The deer at my house let me open the screen door. When I wave my arms and yell at them to go away, they walk curiously toward me. Once in a great while, one will stomp its hoof and snort at me. They are bold. I’m not sure if I should be excited or sad for you. Brazen is the word I use. Deer can be devastating to your garden plans. Sprays are short-term solution. I admit to sprays, but they obviously are not the solution. Hmmm. I’ll have to think about that offer. I have enough trouble with rabbits. You ship me your weeds, and I’ll go for the postage to send you my critters. Deal? I hope you can hold out. I don’t mind them eating a little I guess, but oh my, when they dig up newly planted bedding plants, and unearth sprouts to bite off the seed, I absolutely don’t know how to stop them…my most destructive critters are the squirrels, chipmunks and rabbits. At least I don’t have chipmunks. They are a nuisance, they will run by my feet, or my grandchildren, and even though they are cute, they are still rodents, and hopefully are not harboring disease. Love that pair of brazen eyes. Seriously, there is little better than eye to eye contact with a wild creature. Deer and rabbits seem to be willing to stare at me. Is it overconfidence? I wonder. I hope it helps the psyche. I would be quite happy if a deer visited my garden (here in Sydney that’s almost impossible). If they’ve been eating your favourite plants then perhaps you could distract them with some other plant? What do they enjoy the most? I wish I could find a way to send you a few of my critters, but alas…. 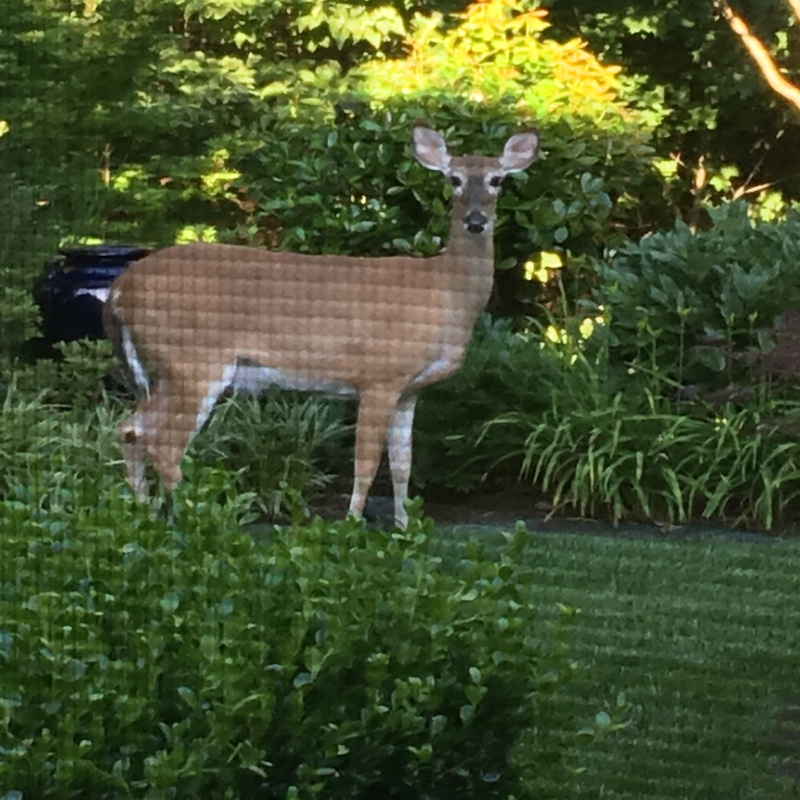 Deer enjoy azaleas, daylilies, roses…all of which I have in abundance. Again, alas.